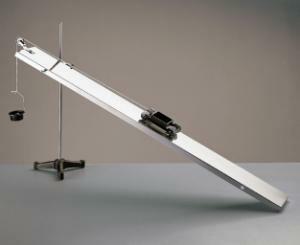 This inclined plane is as straight as an arrow, measures a full 4' long, and will last for years. Is built of nickle-plated heavy steel with rounded corners, and can accomondate just about any kind of cart you choose. Holes in the supporting flanges fit a 10 mm support rod. Includes instructions and a 40 mm molded styrene pulley on a metal bucket to be mounted in a hole at one end. You will need a cart, cord, support stand and rod with clamp and a weight pan or hanger.